With Ted turning 2 all I have heard is "ooh terrible two's"...but we have had nothing but an excited happy little boy the past few weeks. He is eager to learn new things and listens (most of the time) to instructions. I'm not saying he is perfect, no child is but he is a well behaved boy and he makes me very proud. I think part of the trick with Ted is that we have taught him good behaviour from the outset and he knows what is expected of him. I worry that children without any boundaries will often feel confused when faced with discipline as they don't understand what they have done wrong. I never wanted Ted to feel like that so we explain things fully to him and even when we thought he couldn't understand he showed us he knew what we had said. The first example of this was when he was old enough to walk against furniture we would ask him to sit down to eat/drink and after us asking once or twice he would do it automatically whenever he knew it was time for a drink! I wanted to share with you some simple rules we have in our house which make our home a happy, caring and importantly a safe place for Ted to live. 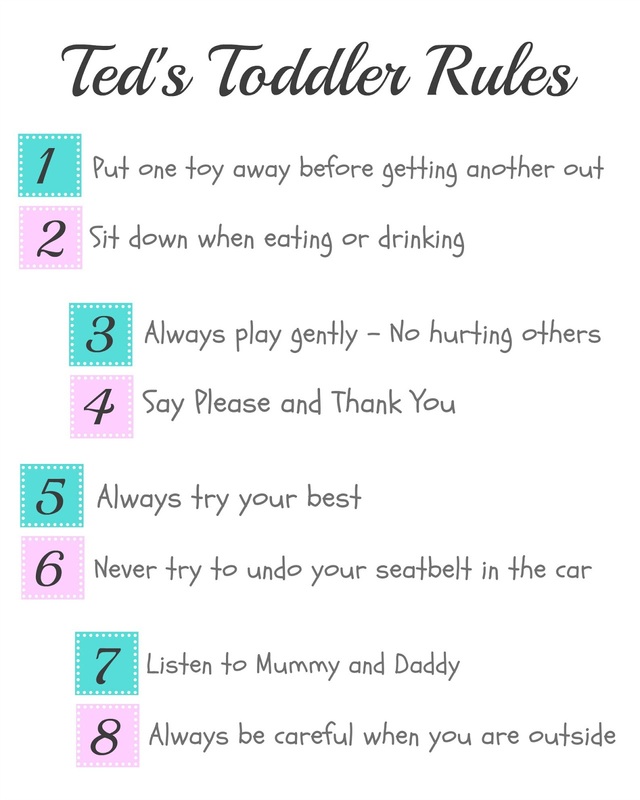 So here you have them...Ted's Toddler Rules. As you can see there aren't many but we want him to learn how to be kind, helpful, polite and safe. All I can do is hope that he will follow numbers 5 and 7 and the rest will fall in place! What rules do you have in your house? I think having rules and routine from a young age is really beneficial for children. They not what to expect each day and what is expected from them also.